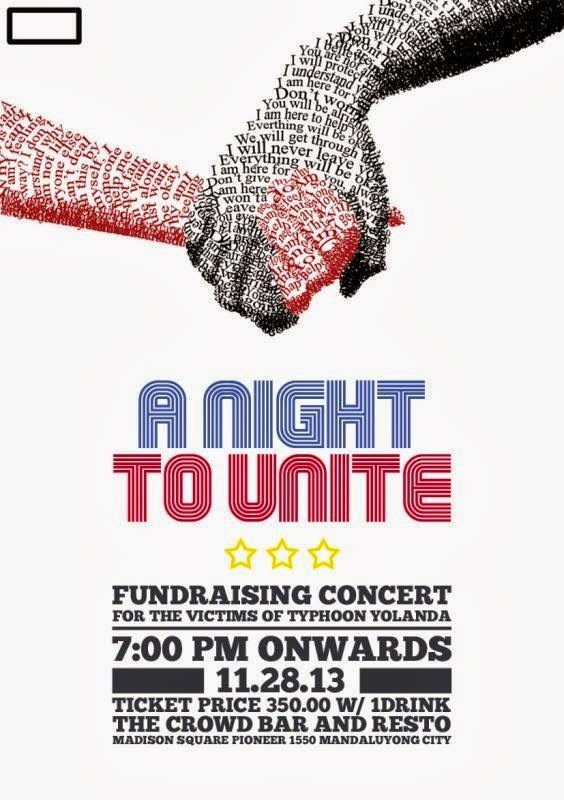 Together, we unite for the victims of Typhoon Yolanda. They desperately need our help in these times of great sorrow. They lost almost everything, let us not let their hopes also get washed away by the flood caused by the terrible super typhoon called Yolanda. We may be a resilient race, but we should be helping out each other to get us back on our feet faster. We are all brothers and sisters that needs to be united and acting as one for the greater glory and success of everyone. We can cope with the loss. We will survive. Christmas is nearing. It is a season of giving and thanksgiving, and what better way of showing this than to give to those who are in need. Php 350 with 1 drink.